A FREE loofah pad is also included in this kit! - Can melt away stress by rejuvenate the skin with Soothing Touch's nourishing Salt Scrubs. 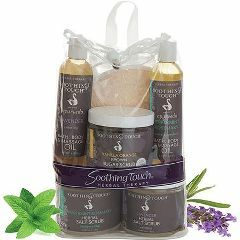 Enjoy these therapeutic creations, made with herbal extracts, essential oils, Vitamin E, mineral-rich Dead Sea Salt and our Ayurvedic Oil blend. These scrubs are ideal for easing stress while exfoliating and moisturizing from head to toe, leaving skin silky smooth and glowing. Kit includes Lavender, and Peppermint-Rosemary. Shelf life: 18 months. - Bring in a luxurious Brown Sugar Scrub made with 100% Organic brown sugar. These scrubs gently exfoliate old skin while locking in vital moisture to keep skin healthy and visibly radiant. Brown sugar contains AHAs, which help to even skin tone and allow for gentle exfoliation. The synergy of the Aurvedic oils and brown sugar produces natural fatty acids, which lock in moisture, firm the skin, diminish the appearance of fine lines and wrinkles and leave skin silky smooth. Shelf life: 18 months. - These oils will sooth and moisturize your clients with the intoxicating fragrance, or add a splash to your bath and soak in this secret luxury. Each formula contains nature's most deeply moisturizing oils, Vitamin E, antioxidants, pure herbal extracts, flower essences and natural aromatherapy. Shelf life: 18 months.